This document describes the reference architecture for the SAP® HANA® Enterprise Storage certification based on the SAP Tailored Data Center Integration (TDI) rules from SAP SE where the Lenovo V Series family of SAN storage systems is used. 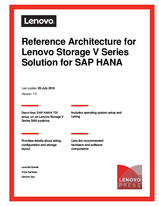 The paper in intended to provide planning, design considerations, and best practices for implementing SAP HANA installation using Lenovo V Series storage products through a storage attached network (SAN) and Lenovo servers. Lenovo and SAP SE worked together on the architectural vision and joint effort to create an architecture for use with the SAP HANA database. The intended audience of this document is IT professionals, technical architects, sales engineers, and consultants who assist in the planning, design and implementation of an SAP HANA TDI solution based on Lenovo Storage V Series storage which allows the SAP customer to use external storage to attach to the SAP HANA compute server.